MSRP: $105,599.00 On Sale! Contact us for Pricing! Learn more about the Yamaha CF4 at any of our three Piano Gallery of Utah locations. The Yamaha CF4 has all the engineering and quality of the rest of the CF series but in a more compact frame. At 6’3″, this remarkable grand piano is still a full-sized grand, but more compact than its concert grand piano counterparts. Even with its smaller frame, this piano still offers the power and depth of sound suitable for recital halls or teaching studios. European Spruce Soundboard. European Spruce is the best wood for achieving optimal resonance and tonal quality in the piano. For this reason, Yamaha utilizes this wood in its Yamaha CF4 grand piano and in the entire Yamaha CF series. Hand-Molded and Sand Cast Metal Frame. The metal frame of the Yamaha CF4 is hand-molded and sand cast. This enhances strength and stability of the piano and contributes to an outstanding tonal quality. Impeccable Finish. Yamaha takes great measures to ensure an impeccable finish on the Yamaha CF4. The wood is sanded gradually with the grade slowly changed each time. The finish is applied one layer at a time with meticulous buffing in between each. The result is a flawless finish. For more information about the Yamaha CF4, visit the Piano Gallery at any of our three locations. 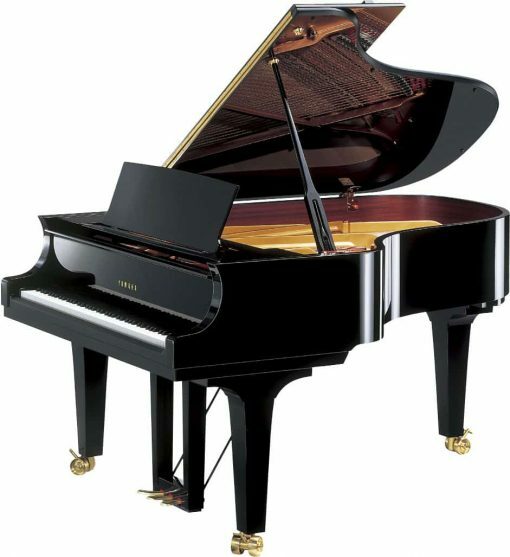 We are Utah’s exclusive Yamaha Piano dealer and the largest piano store in Utah.